What is Laghu Rudra Homa? ‘Sri Rudram’ is a Vedic hymn written as a prayer to Rudra, a form of Archetype Shiva, to transform from his fierce form to peaceful form and shower us with his blessings. This prayer has two parts with each divided into eleven sections. The first part has verses ending with the term “Nama” and hence this part is named ‘Namakam’ or ‘Rudram’. The second part is named ‘Chamakam’ as the verses end with “Cha Me” which means “let this be granted to me”. 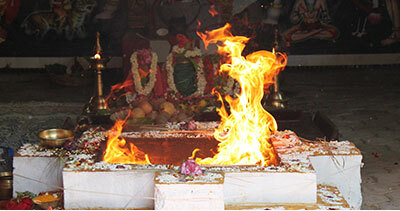 When the Sri Rudram is chanted along with a homa, then it is termed as Laghu Rudra Homa. The purpose of Laghu Rudra homa is to appease the Eleven Powerful Forms of Rudra (Shiva) and offer prayers to the Supreme Being for removal of sins and fulfillment of wishes. It is believed that during Rudram chanting, the first part, you bring Vedic archetype Rudra to his peaceful state and during Chamakam chanting, you ask him for your wishes to be fulfilled. We specially invite you to attend this special fire lab in person with your family, friends, and relatives to receive the blessings of Lord Rudra. Please send an e-mail to sales@astroved.com to attend the Grand Fire Lab at Hyderabad. Participate in the RARE 12-PRIEST LAGHU RUDRA HOMA (Wish Fulfilling Homa) on June 25th (IST). This grand homa will be performed by 12 Vedic priests at Hyderabad. Laghu Rudram, or the Rudra Ekadasa Homa, is very powerful for clearing previous karmas. Sri Rudram’ is a Vedic hymn written as a prayer to Rudra, a form of Archetype Shiva, to transform from his fierce form to peaceful form and shower us with his blessings. We specially invite you to attend this special fire lab in person with your family, friends, and relatives to receive the blessings of Lord Rudra. The venue details are mentioned above. You will receive the Energized Shiva Shakti Bracelet along with sacred grey ash powder and kum-kum (Red Vermillion Powder), which will be blessed in the rituals. Keep this on your meditation altar and wear it on your forehead during meditation or at other times to expand the Divine blessings into your life. Please Note: Your energized Shiva Shakti Bracelet and Prasad will be shipped from Chennai, Tamil Nadu. Please allow 2 – 4 weeks for delivery time after the entire set of rituals is performed.